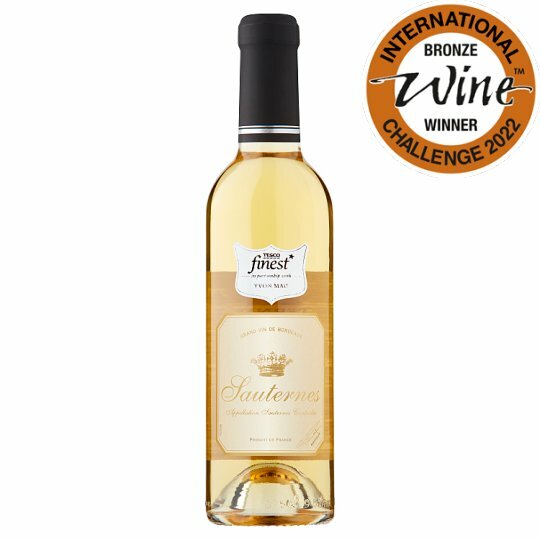 A sweet, luscious dessert wine with flavours of honey, dried apricots and baked fruits and a citrus refreshing finish. Made from hand picked grapes from a prestigious château in Sauternes and aged to enable the complex development of richness and flavour. A classic partner to Roquefort, duck liver pâté and fruit based desserts. Store in a cool dark place. Grapes are meticulously harvested by hand; the botrytised grapes are then repeatedly sorted so that only those perfectly affected by noble rot are used to create the final wine. Fermentation is temperature-controlled in the winery, after which the wine is placed in oak barrels and matured for around 18 months. The individual grape varieties are carefully blended after maturation. The Sauternes region has produced uniquely sweet style wines since well before the 18th century. The vagaries of climate from vintage to vintage, the extended length of time winegrowers must wait for noble rot (botrytis) to develop in the vineyards, and the time-consuming and meticulous harvesting techniques, combine to make Sauternes a very expensive, and very challenging, wine to produce. The Sauternes region is located about forty kilometres southeast of Bordeaux. There are five communes: Sauternes, Barsac, Fargues de Langon, Bommes and Preignac. The Sauternes region is unique in that it is dedicated to producing exclusively sweet style wines. It excels in the development of "noble rot", or Botrytis, which is the critical ingredient in producing these great, naturally sweet wines. Sauternes with blue cheese or foie gras are classic wine and food pairings; it also makes a delicious aperitif, or digestif after a meal.